A few weeks ago this skirt popped up on ASOS at a price of just £13 - how was I supposed to resist this? 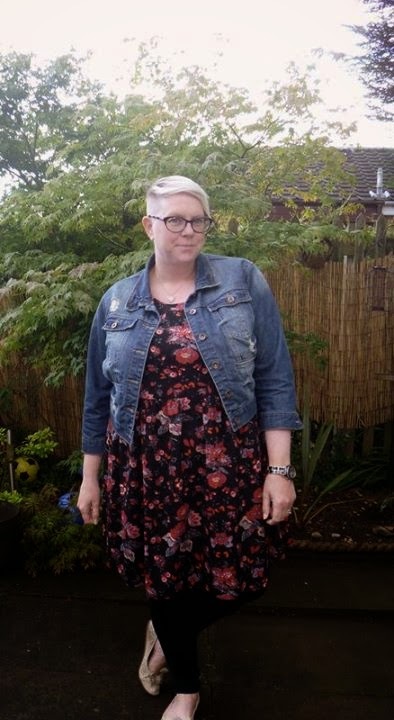 I wore this for dinner and drinks out on Sunday afternoon in London, after a heavy night out in London the night before (School disco party at Club Indulge was never going to be pretty). 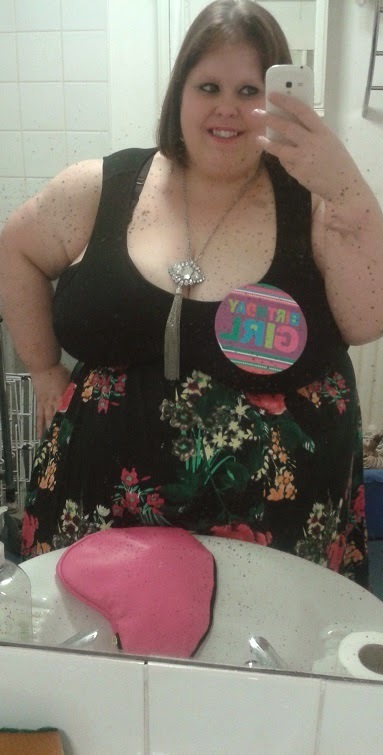 I teamed it up with a plain black cami top (also from ASOS), a grey kimono (New Look) and a pink heart shaped bag (from New Look). 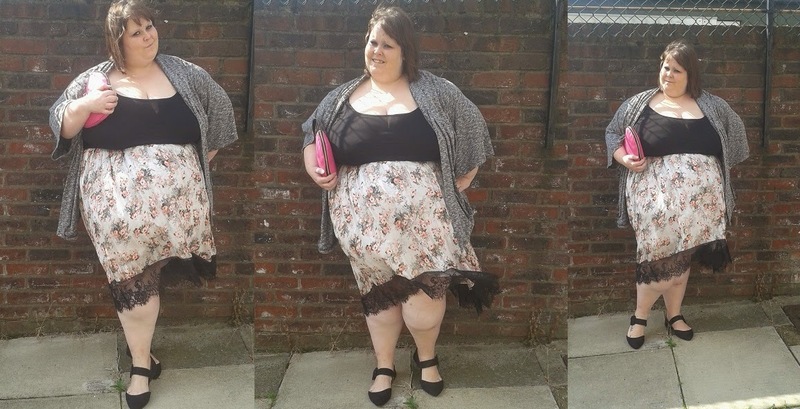 It was a bit windy when I took the pics so you'll have to excuse the windswept look, but it gives you an idea of just how pretty the skirt is! It is a little outside of my comfort zone of what I would usually buy but I am really glad that I bought it - it's so pretty! 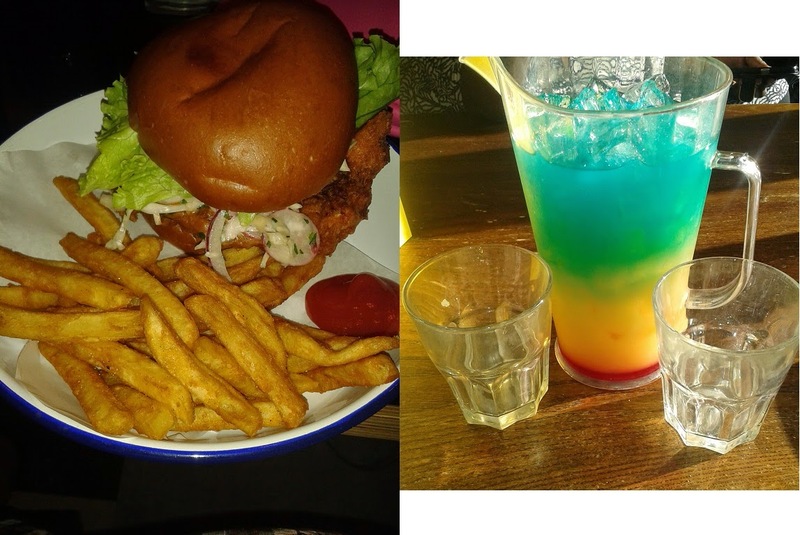 Dinner at Grill Shack and Yates cocktails - no better way to spend a hungover Sunday afternoon! Lucia from U Can't Wear That bought the skirt too! 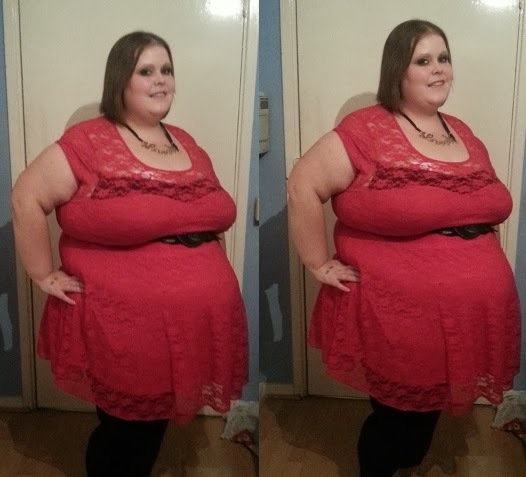 As you can see she looks brill in it - read her review here. What sale bargains have you grabbed lately? 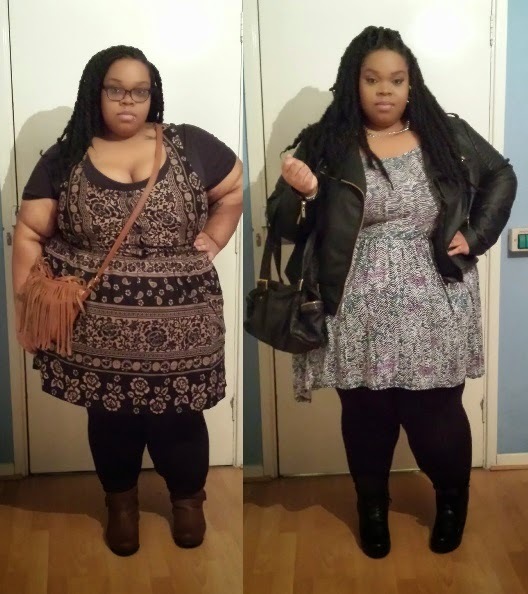 I don't know if it is just me, but I really feel like ASOS Curve is killing it at the moment. 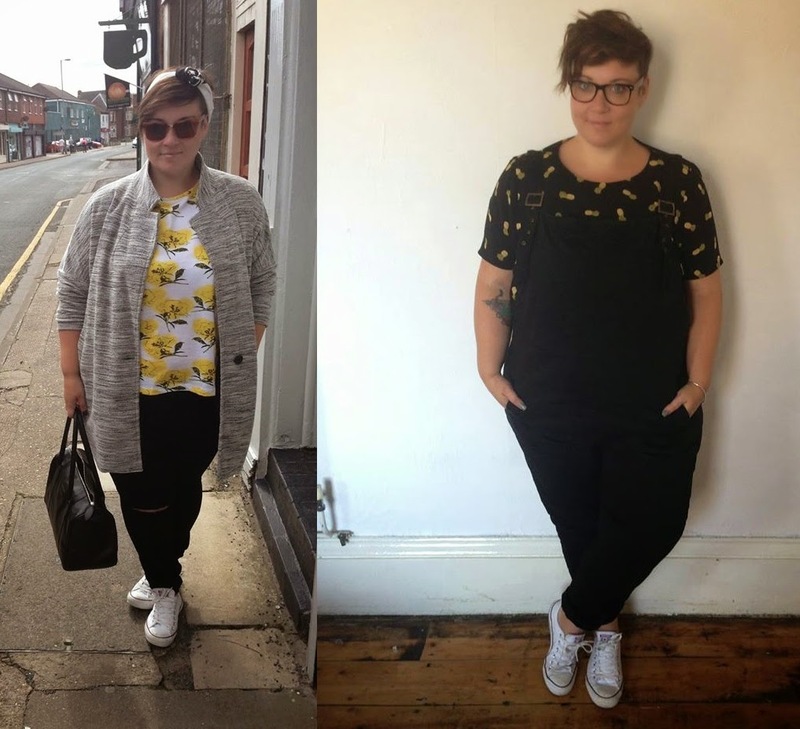 What I like about browsing the range of clothes at ASOS Curve is that it always feels like there is a selection of outfit types... like they're a plus size retailer that actually recognises people like different things. 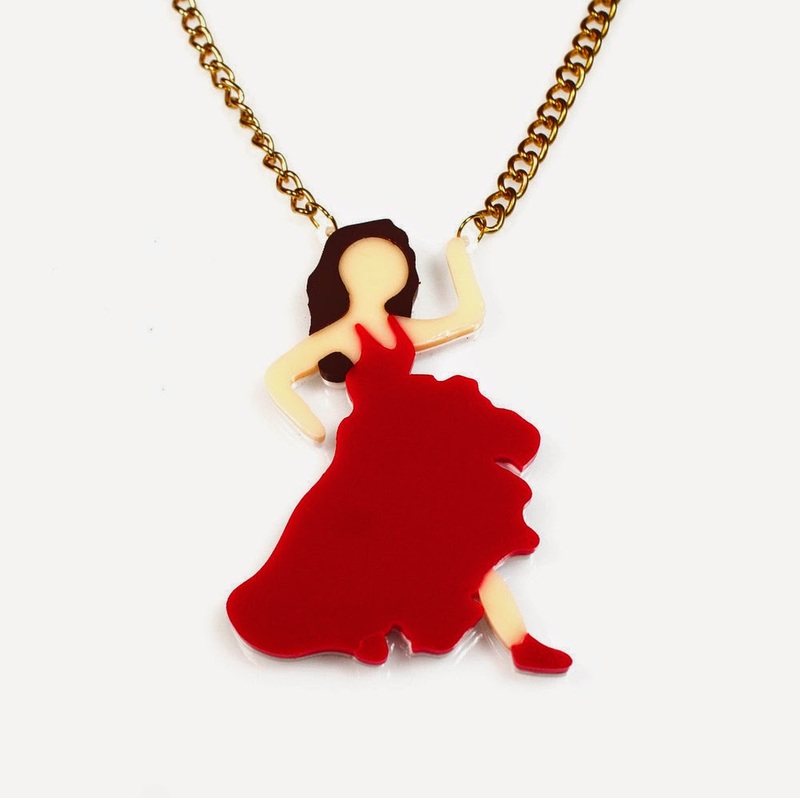 From skater and swing dresses to over sized t shirts and bodycon dresses there is all sorts! 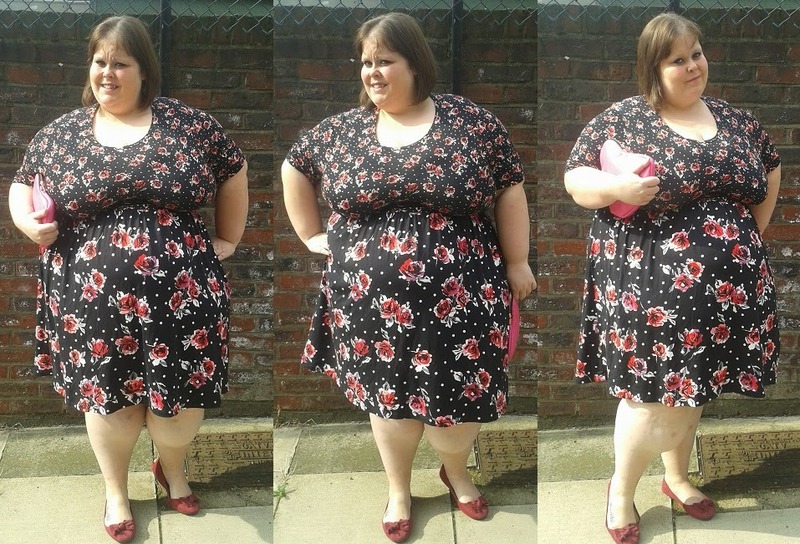 I love a bit of floral and I think that ASOS do these patterns so well! A bit of smock dress loveliness from Natty Nikki! Have you tried ASOS yet? Did you like it? Ahhhh I am in love and I want to shout it from the rooftops! In fact if you follow me on any social media forums then the chances are that you have heard about my love affair already! This dress... LOOK AT IT!!!! Have you ever seen anything SO pretty?? I can't really blog about it too much because it's now out of stock on ASOS, but it is BEAUTIFUL!! 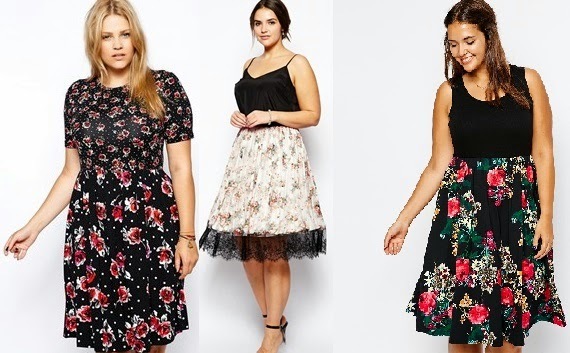 I really love what ASOS are doing at the moment - there are so many Curve dresses that I have my beady eyes on! 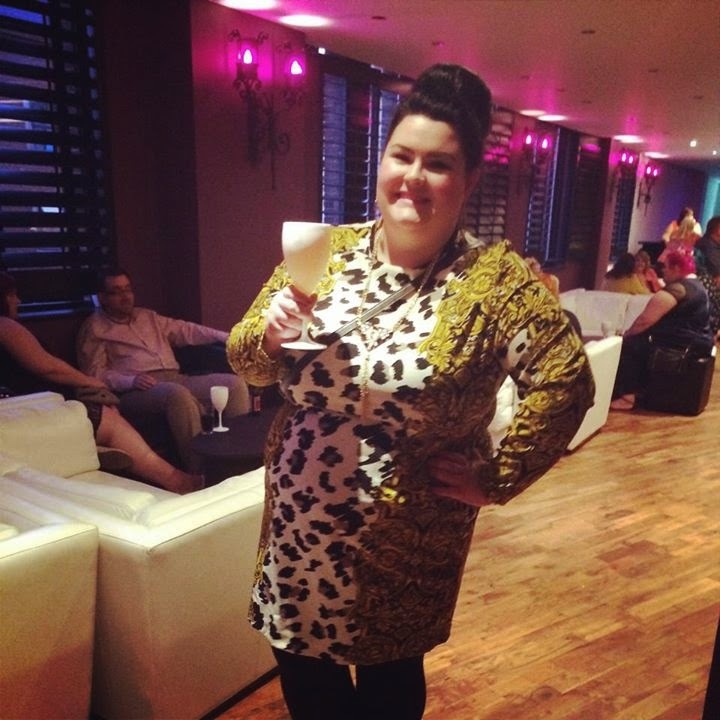 I wore this dress to the Style XL event in Leicester a few weeks ago. 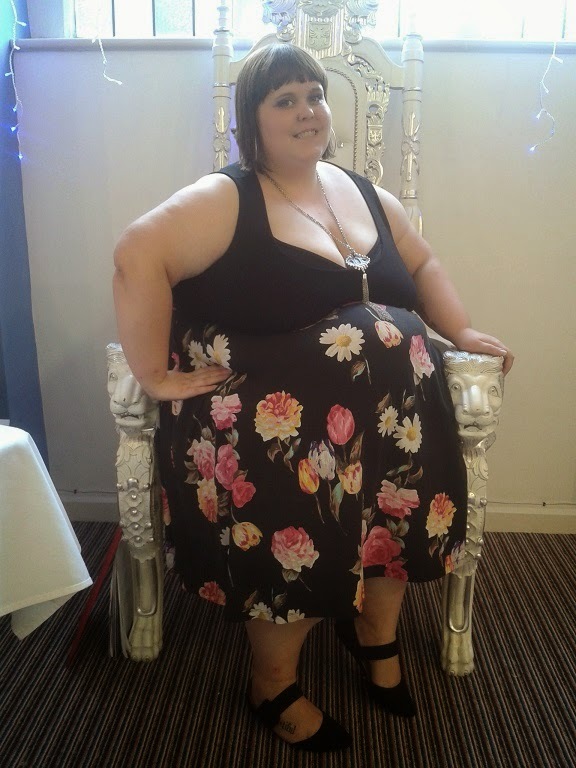 This was a Midlands based plus size fashion show put on by Leah and it was a brilliant day! 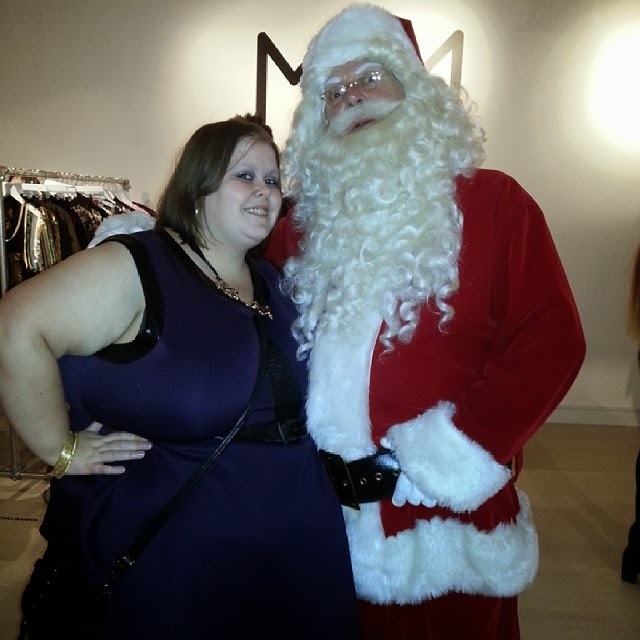 It was lovely to see so many of the brands getting involved, plus size bloggers strutting their stuff in next seasons fashion offerings and of course geting to catch up with everyone! 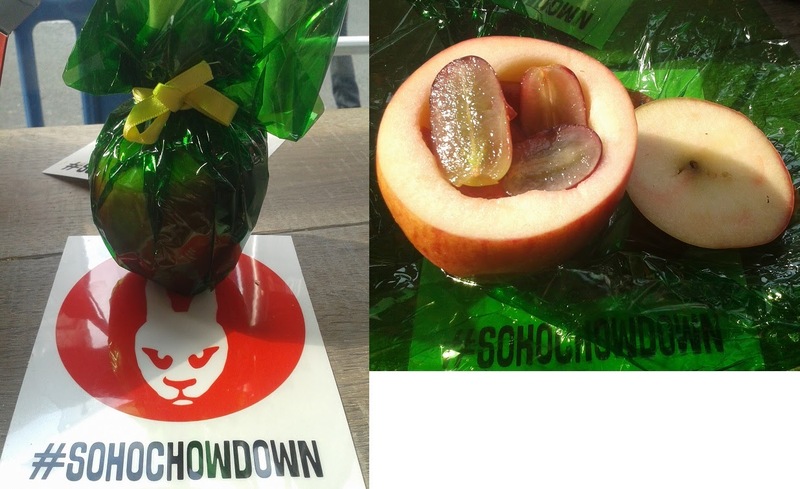 There are lots of blog posts about the event around so make sure you give them a read - as usual I was too busy having fun(*read eating cupcakes) to take photos so I don't have much to share at all. 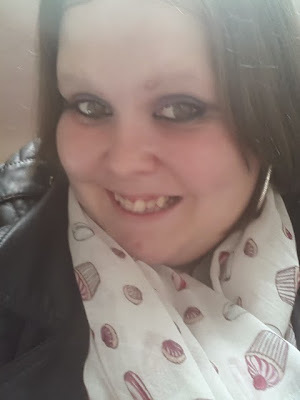 Leah announced that she plans to do the event again next year, so that is well worth keeping an eye out for. 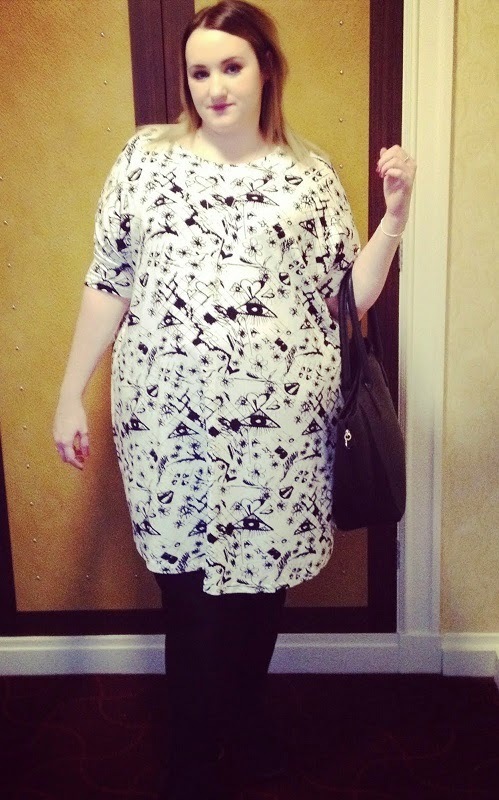 Just a very quick post today - a look at what I wore to British Plus Size Fashion Weekend. I am a little bit bored of normal dresses and leggings at the moment - just because that is all I seem to wear! So I am trying to break out and wear something a little different - BPSFW was my first time doing this! 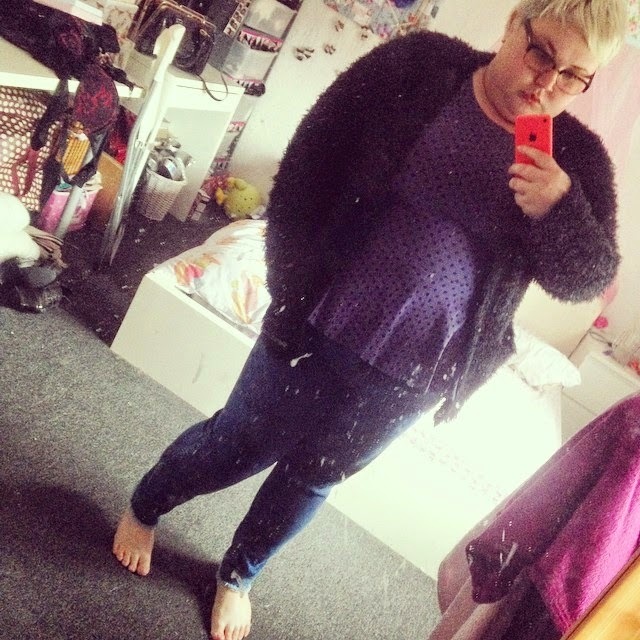 Jumper - Matalan - this is about 3 years old and this is the first time I have worn it! 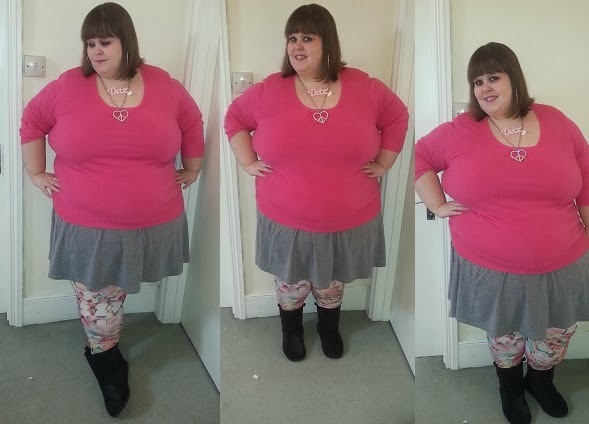 There really isn't much that I can say about these leggings, except that I love them!! They're from Primark, a size 16 and a bargain price of £6.00! 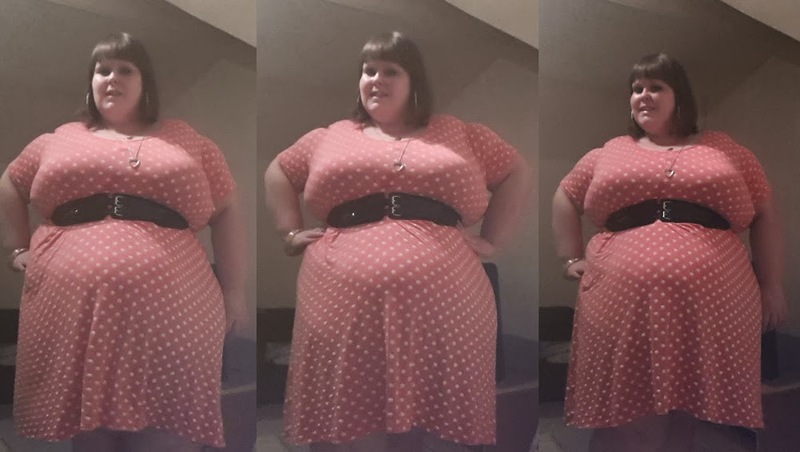 Yet another lesson that you can pick up bargain clothes just about wherever, as long as you ignore clothes sizes! Do you have funky, unique clothes in your wardrobe? Yes... The typo is on purpose! I know, I am THAT funny! 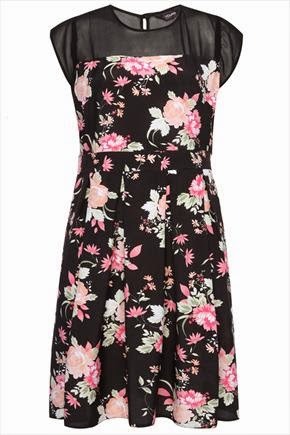 I love the skater dress because it is a longer length - although I have tucked it up under the belt because I wanted it to be a bit shorter for the night out I was going on. I love the versatility. 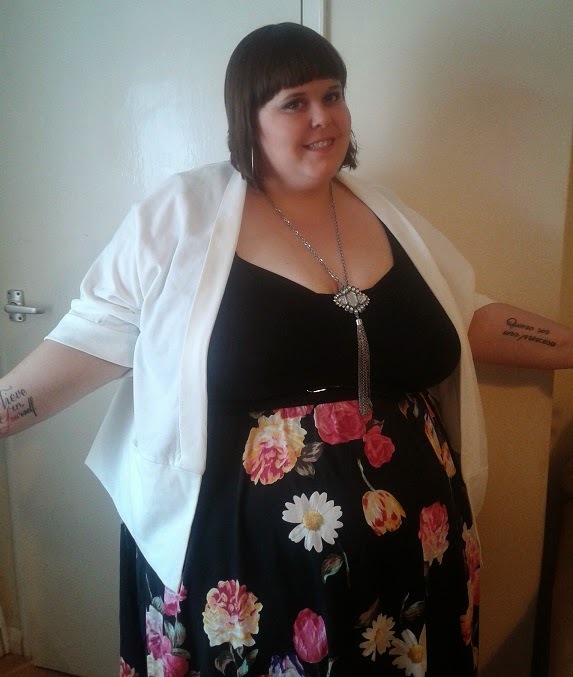 Teamed it up with a black belt that I picked up at the Plus London Plus Size Market for the grand old price of 50p! 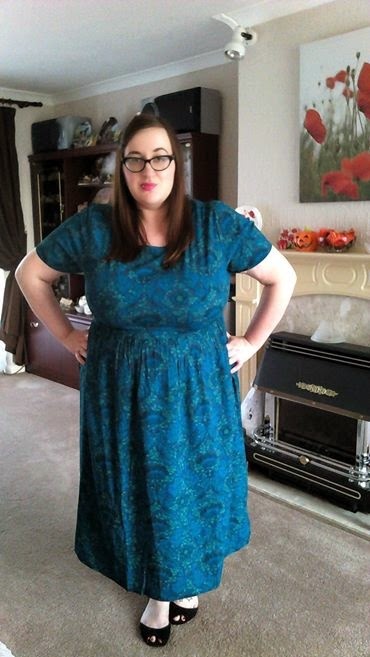 If you're looking for a dress or two for a bargain price, I really can't recommend the ASOS sale enough at the moment. 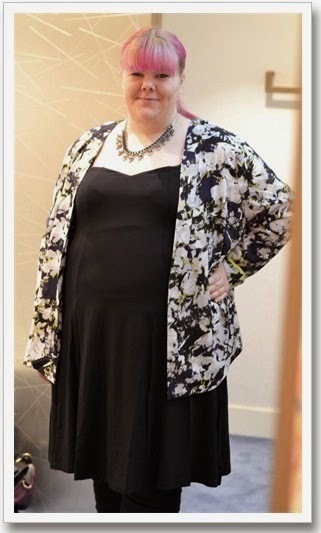 I have wanted to try Lovedrobe for a while now, but it is something that I just haven't ever gotten around to! 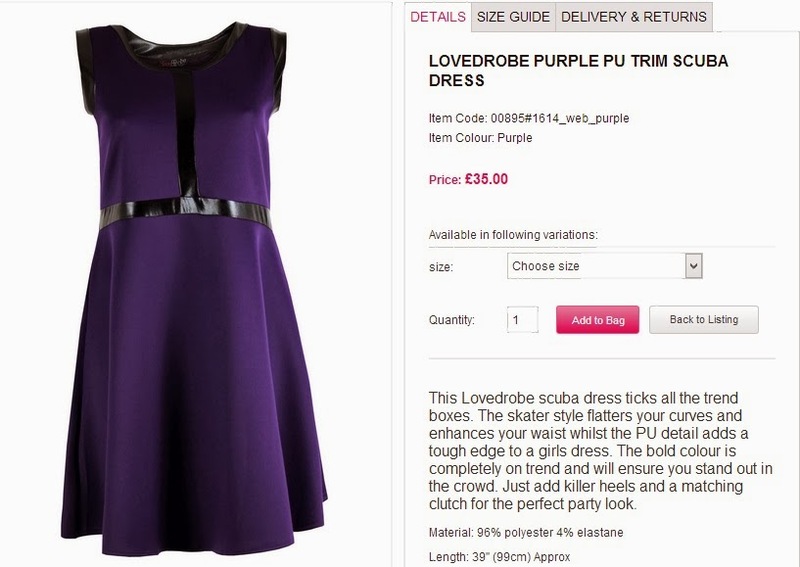 A few weeks ago I managed to get my hands on their Purple Pu Trim Scuba Dress - and it's love! 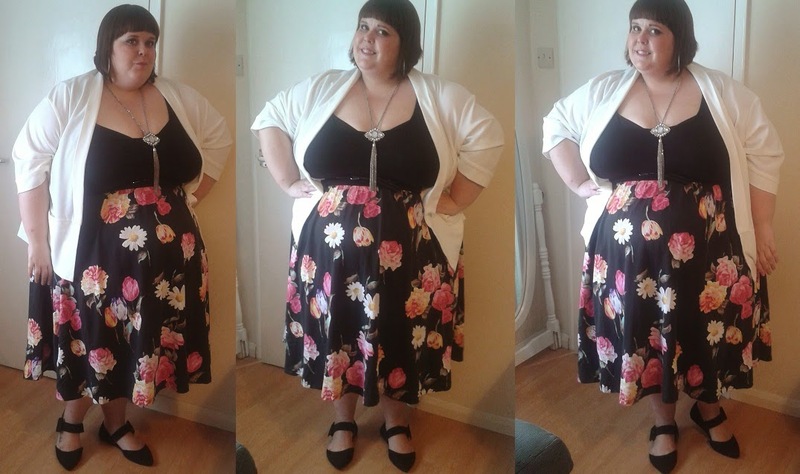 The dress goes up to a size 26, which I know would get some people worrying about how it will fit them. However, as you can see from the photos - it fits me just fine! Sorry about the poor quality - I had no one to take them for me, so I am using my trusty phone! 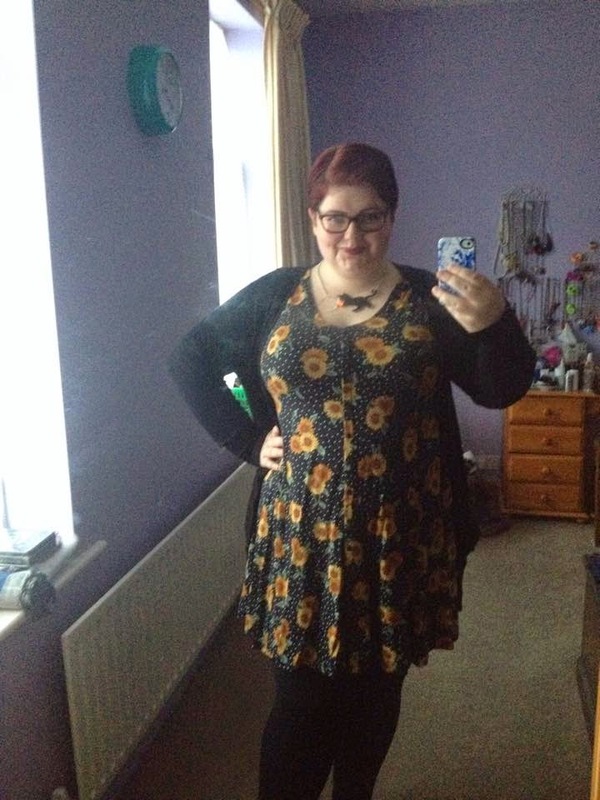 The dress is quite short on me (probably because of the sizing) but teamed with leggings it is more than fine! 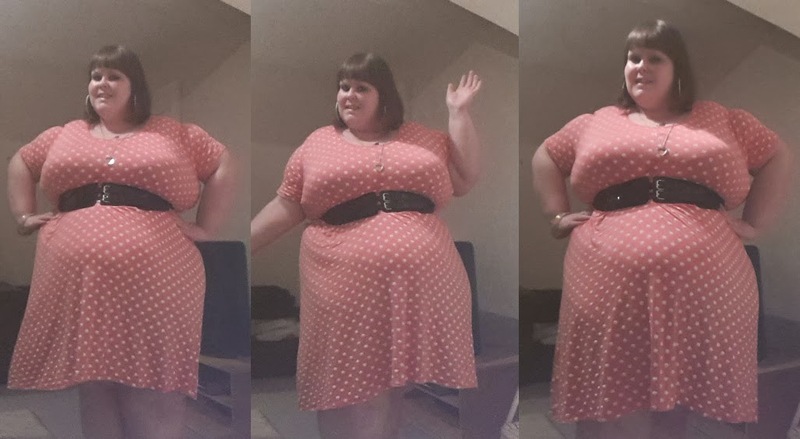 I love the shape of the dress & think it is quite flattering. What I love about it is the PU trim, which brightens the whole dress up for me - you know, I usually go for much brighter colours and patterns. Seeing as it's winter and a wee bit chilly out there, the dress needed something more to keep me nice and toasty. I teamed it up with some grey wooly boots and this New Look leather jacket, which I believe is currently reduced in the sale! 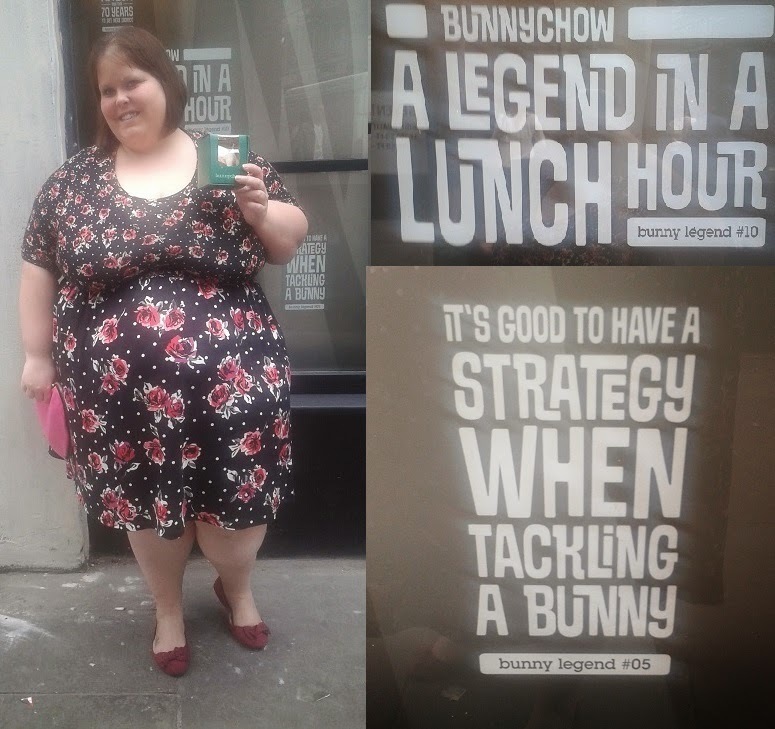 So there you have it - another plus size brand tried & tested. 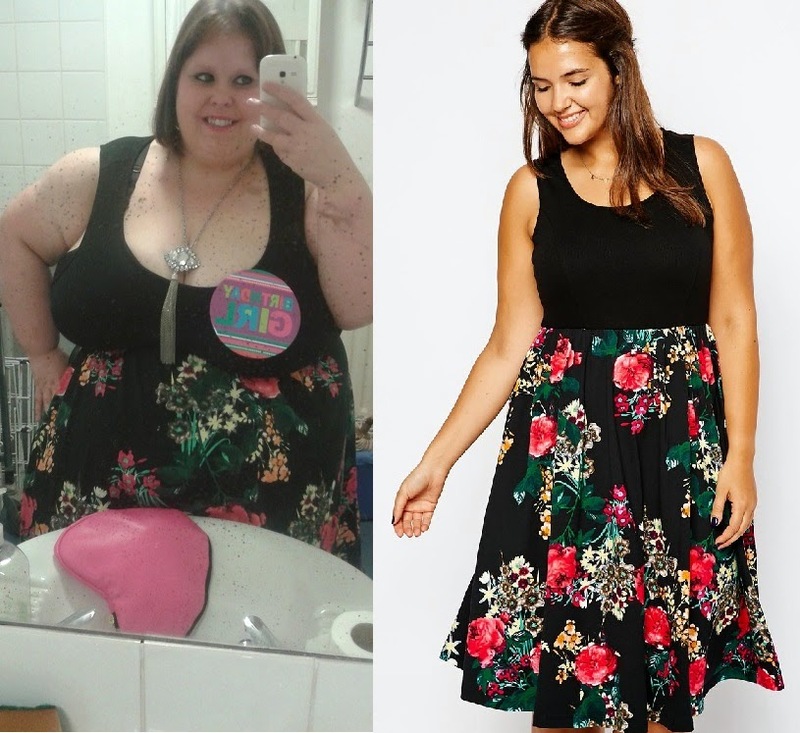 I would like to try move of their products, especially in my size but this dress has definitely peaked my interest in the brand! What brands would you love to try that you haven't quite gotten around to yet? A few weeks ago my flat mate sent me a link to a website called 'Access All ASOS' which invited people to apply to be an ASOS Insider. Once I read the first few paragraphs on the page, I knew I had to apply! "Do you heart ASOS? Have you ever wanted to know what happens behind the scenes of your favourite fashion giant? Well, we have some pretty exciting news! We’re about to throw open our doors to let you see all the crazy goings on at Planet ASOS… and you can be a part of it all, too. #AccessAllASOS is an exciting new destination for our most loyal fans, where you’ll get unprecedented access to all things ASOS. As an ASOS insider, you’ll be the first to know about our new collections, inspirations and adventures. You’ll get opportunities to visit ASOS HQ in London, as well as invites to our most exciting events. You’ll be able to really get under our skin and learn how we do what we do. There might even be the odd freebie or exclusive discount…So if you’re passionate about ASOS, step right up!" How could I resist? So, I sent about filling in my application form! I wasn't sure how successful I would be, because I assumed they would mainly be looking for people who shopped from their main ASOS range, which of course I don't. However I filled in the form telling them about my new found love for ASOS Curve, and why I am so passionate about brands just like them! And then a few days ago - this amazing package of lovelyness arrived! I can not tell you how excited I was to be an ASOS Insider! 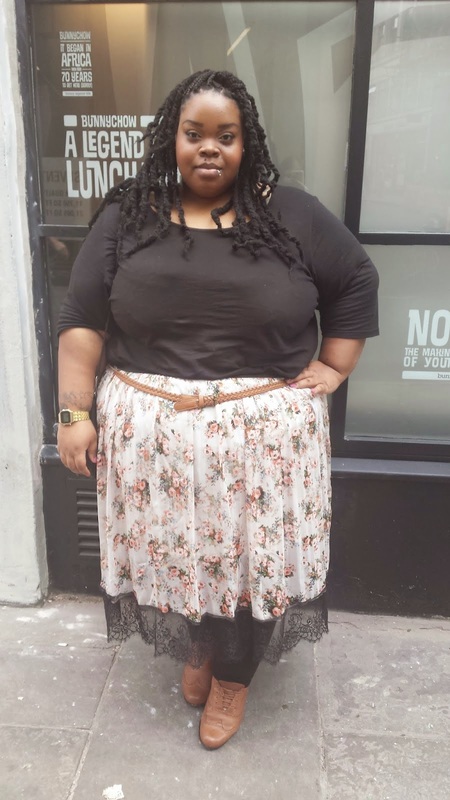 I have since had a nosey on the #AccessallASOS hashtag on twitter and I have to applaud ASOS. All the people who applied got different gifts, thoughtful and well matched - as well as a lovely handwritten note to welcome them to the team! I am part of the very first bunch of ASOS Insiders, so I have no idea what the future holds - but how exciting! I think there is nothing better than a brand who listen to their customers and interact with them and it sounds like that is exactly what ASOS Insiders is all about, so I am keen to see what it brings! Applications for 2013 are closed, but you can go on their site and apply for 2014 - how exciting! What would you like to see brands doing more of? I know, I know - what a lovely, imaginative title - you lucky bunch! My creative juices are really flowing this morning, can you tell? 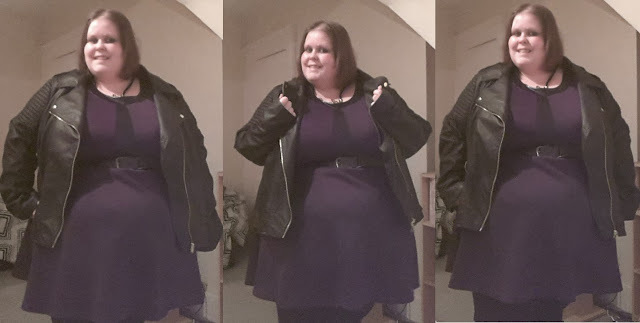 Anyway, I finally got around to wearing this lovely purple wrap dress that I got from ASOS for my birthday (thanks Gem!) 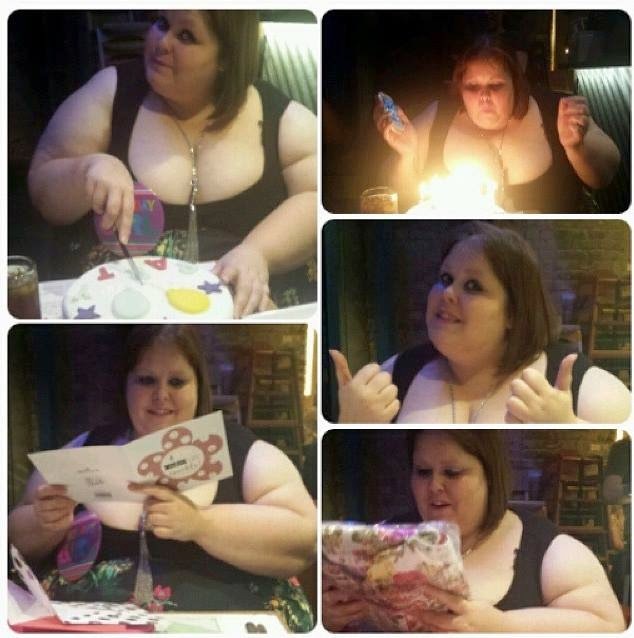 and thought I should blog about it! 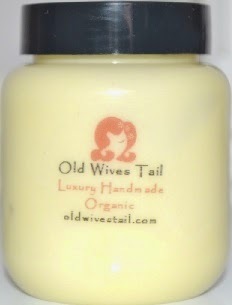 - It's also now only £15.00 in the sale - bargain! I teamed it with leggings (obviously!) 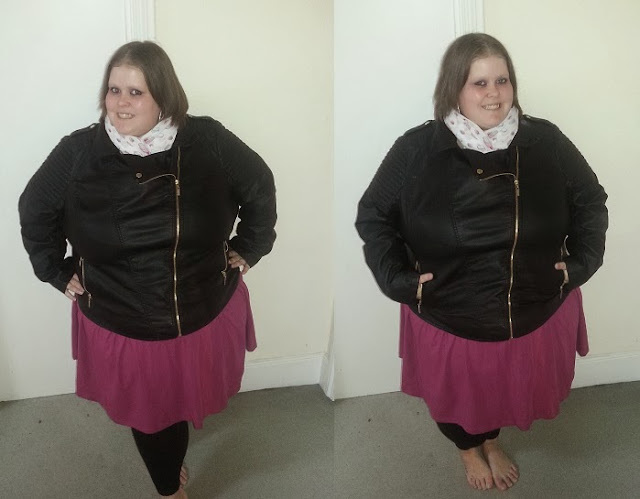 and then to leave the house I wore my New Look biker jacket and a pretty cake scarf which I also got for my birthday! 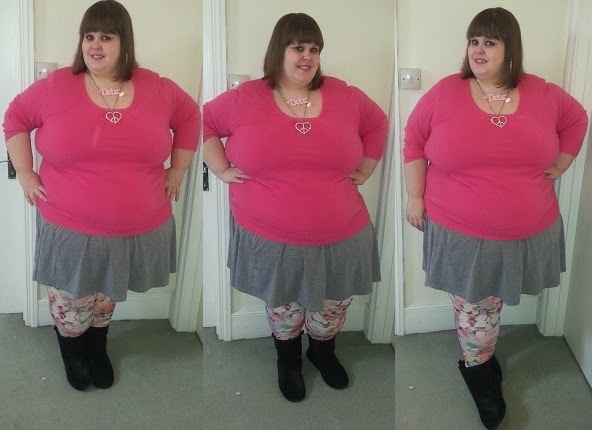 As always I am loving my accessories - I teamed this outfit up with my new Black Heart Creatives necklace (Thanks Leighanne) and a long, heart necklace from Primark! I am notoriously bad for wrapping up warm for winter - I hate layers and wearing too many heavy clothes so generally I don't wrap up at all! This is the first coat (jacket!) I have owned in years. That said, I do love the look and the fit of the jacket so I don't see any reason why I wouldn't carry on wearing it for winter - seeing as it's freezing already, I think we're in for a cold one! Have you bought anything new for your winter wardrobe?